With the Christmas holidays now being a distant memory, we have been counting down the days to February half term so that we could spend some quality time together as a family. My husband works in a school in England, and our children attend a school in Wales and so a lot of the holidays unfortunately don't match up this year, so we have been really looking forward to getting out and about and finding some fun new things to do! 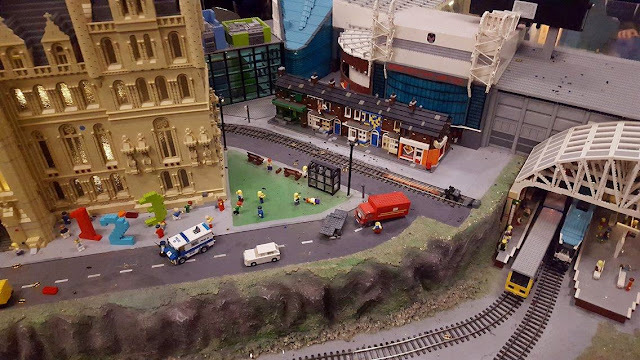 Despite only living 45 minutes away from Manchester, somehow we have never got round to visiting the Legoland Discovery Centre. 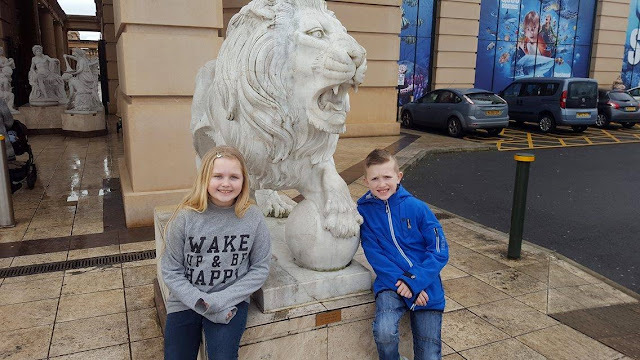 We frequent the Trafford Centre quite regularly and have often seen it advertised but for some reason we have never quite made it through the doors to experience what it has to offer. 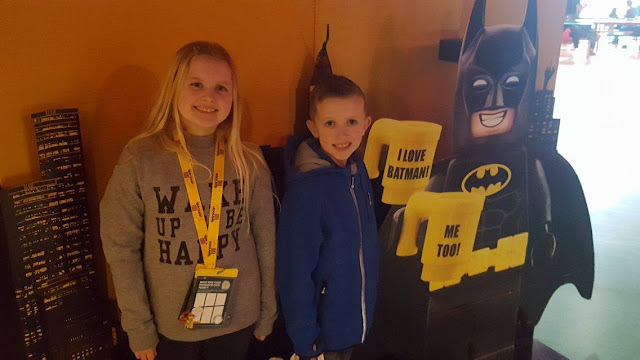 I was therefore really excited to be invited along on Monday as a family to discover what it was all about, and my youngest son Riley was absolutely ecstatic to discover that someone else very special would be there that day too - Lego Batman! We began our journey at 9am on the Monday morning, stopping for a cooked breakfast at a restaurant on the way. I often do this when heading out for the day, as it keeps the kids full and prevents those recurring questions and comments of "I'm hungry" and "When are we going to get something to eat? "echoing through my ears every few minutes as they take it in turn one by one to ask the same questions throughout the morning. We therefore arrived at The Trafford Centre at around 10:40am and parked in the Barton Square car park which is the nearest car park to both the Legoland Discovery Centre and Sea Life. Riley became really excited as we made our way from the car park to the attraction, with him noticing a huge window display on the outside of the building. We knew that it would be a popular place however we were shocked to see the size of the queue when we first arrived. Therefore if you are not a fan of queues then I would recommend either getting there just before opening time so you are near the front, or making your way there later in the afternoon. You can also pre book your tickets online if you want to be sure of securing a specific time slot for entry. One piece of advice I would give is wrap up warm and take a brolly, as the queue is outside so it may get a little cold or wet. 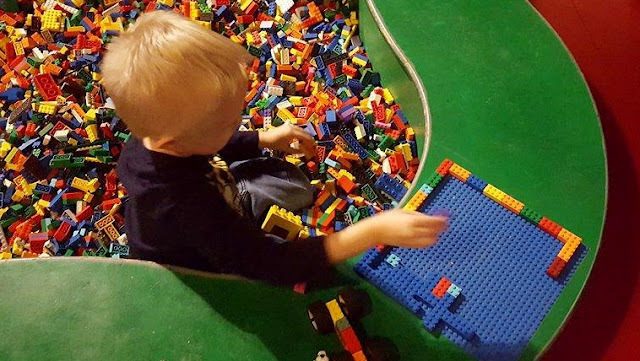 Once inside my children declared that they were in Lego Paradise. 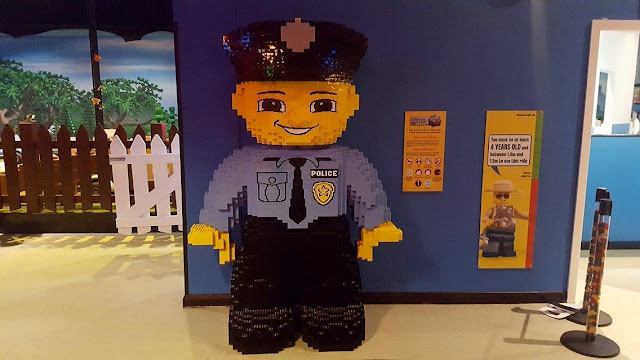 We have visited Legoland Windsor before and knew that this would not be on the same scale, but my children were in their element right from the very beginning. On entry to the attraction we were asked to sit down whilst a photographer took our picture against a green screen. We always have these photos done at attractions, sometimes I buy them and sometimes I don't, but I always have the photo taken just on the off chance that they somehow manage to capture a beautiful family photo where all three children are smiling and facing the camera at the same time, as believe me this is quite a challenge! We were asked to smile and pose in several ways so that the picture would fit the image that was later applied to the background. After our picture had been taken, we were given a ticket so that we could view our photograph at the end. We then made our way up in the lift which took us to the entrance of the factory tour, where we were introduced to the Professor. 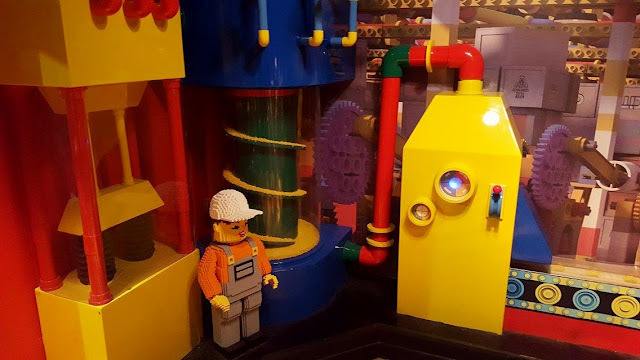 He provided us with a short interactive demonstration of how lego bricks are created and invited the children to get involved in the process. There was lots of jumping and button pushing to get the machinery going and the children were rewarded for their help with an individual brick each. As we then entered the main attraction area, we came across our first ride which was the Kingdom Quest Laser Ride. We were all able to fit in the one car which was great as we are so used to having to split up into separate seats on these kinds of rides so it was nice to be able to enjoy it all together and compete against one another in getting the highest score. We all really enjoyed this ride and there was no queue at all, we simply walked straight on, and were made to feel really welcome by the lovely gentleman running the ride. Riley who is 4 was able to hold his laser shooter with ease and was happy that it went at a gentle speed so he wasn't scared at all. After the Kingdom Quest Laser Ride we carried on our adventure into Miniland, that featured a whole host of recognisable landmarks and structures all made out of Lego. I loved the Blackpool Tower display especially when the main lights dimmed and the tower then all lit up, it looked spectacular. There was even a mini Coronation Street! Although I could have spent a fair amount of time wandering around the Miniworld area, the kids were keen to try out some more of the rides and so the next stop was the Lego City Forest Pursuit Ride where children can drive around in Lego police cars. Children need to be a minimum of 4 years of age to ride on this, and my son was so happy to be both old and tall enough to go for a drive. Unfortunately he wasn't the best at steering, but one of the staff members helped him round and made sure he had no bumps. 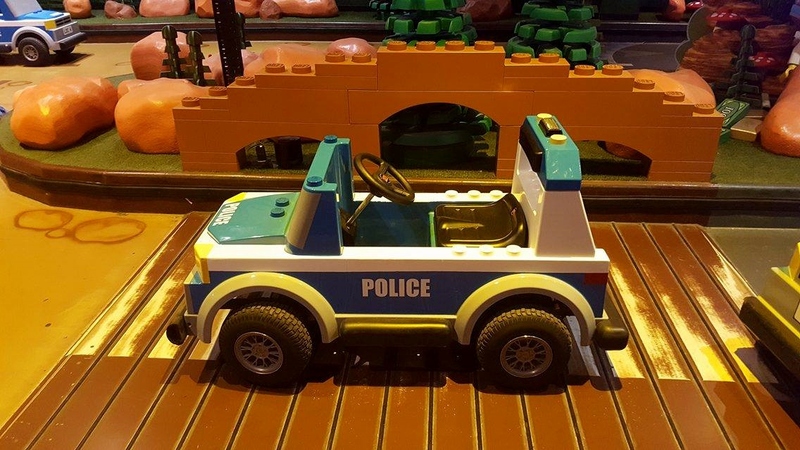 The vehicles are a great little design and look just like the Lego police cars you can build in the Lego City sets. They are operated by a one pedal system so it is easy for children to understand how to use it, and they simply need to keep their foot on the pedal whilst driving and steering around the course. The course is in a simple oval shape so there is nothing too complicated to try and manoeuvre around, and they are speed limited so there is no need to worry about anyone going too fast. 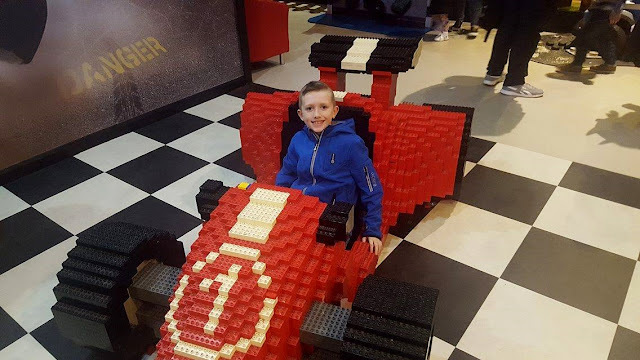 Next to the Lego City Forest Pursuit area was the Lego Racers Build and Test Area where this fabulous racing car was also located. 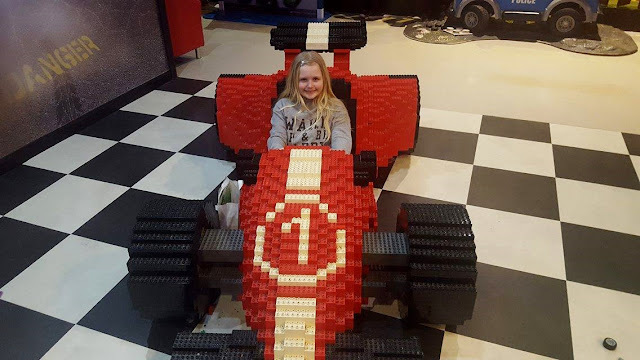 The racing car looks fantastic and is big enough for children to sit in to pose for a picture, or pretend that they are speeding round a race track. The build and test area allows you to use your imagination to build a racing car creation that you can race down the speed test track. After the fun and excitement of the Kingdom Quest Laser Ride, and the Lego City Forest Pursuit, Riley decided he wanted to rest and sit in one of the many lego pits that were full to the brim of lego to build and you could make anything you could think of. I genuinely believe that Riley could have sat here for hours, and he began to make a house on one of the built in boards around the edge. Next up was the Merlin's Apprentice Ride. 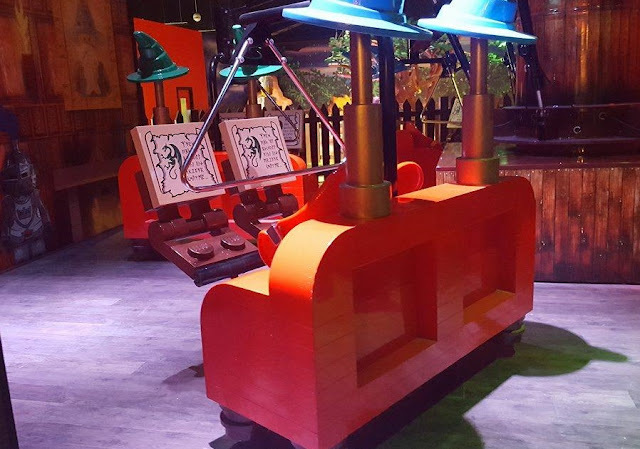 On this you have to pedal fast as you go round and round, which helps to raise your vehicle to the skies, so that you can help Merlin with his magic. Riley loves rides that go up and down, especially as he knows that I am not a big fan of heights, and so he often finds this hilarious. Emma and Ben also equally enjoyed this ride though, and thought that having to pedal was a fun feature. After we had been on Merlin's Apprentice ride, it was the moment that Riley had been excitedly waiting for. It was time to meet..........Lego Batman! Riley absolutely loves Lego Batman at the moment, and has been collecting the mini figures in the blind bags with his pocket money. He waited patiently in the short queue and when the moment arrived he ran straight to Lego Batman and gave him a huge hug. That moment alone literally made my day, as he was just so so happy. 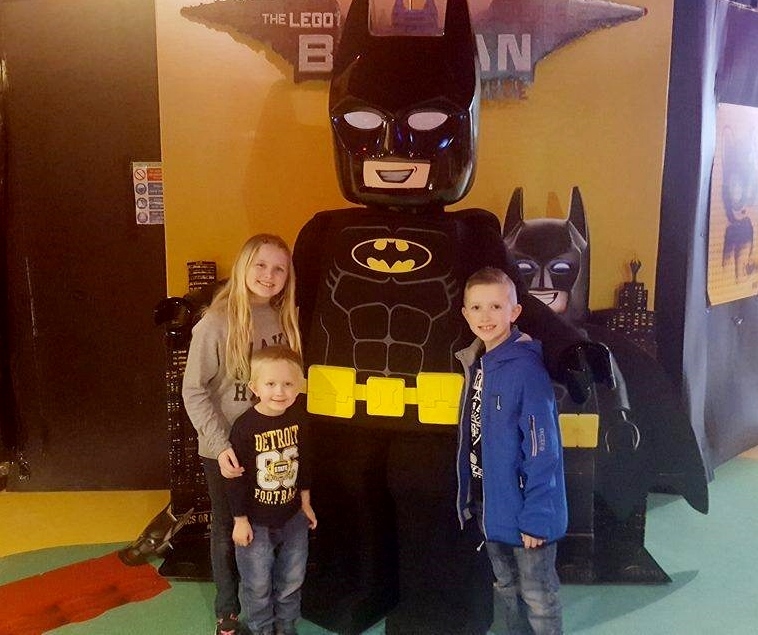 All my children then posed for a picture which we were able to take ourselves and Riley then gave Lego Batman a further big cuddle before heading back to play with the Lego again. The costume was fantastic, and Riley is now insistent on me either buying or creating the very same costume for him to wear to school! 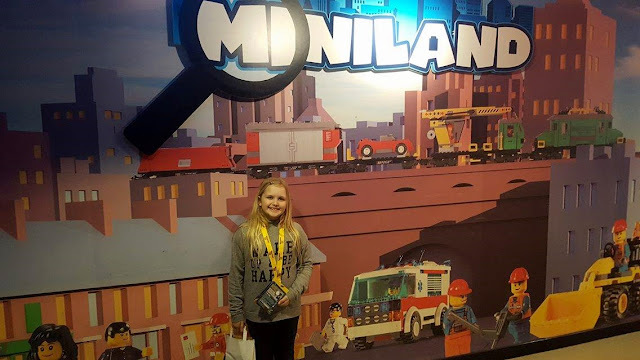 After another play in the Lego we visited the 4D cinema and watched a great short film that followed Emmet, Wyldstyle, Unikitty, Metalbeard and Benny on an adventure in a strange theme park that is actually part of an evil secret plot. The 4D film features some great effects, however we had squeezed into the last 5 seats that were together on the back row, and so we didn't feel the full effects of some of these. If you want to get the full effect then I would recommend sitting in the first couple of rows, however you get a good 4D view from wherever you are sat, and my children were more than happy with this. I kept watching Riley trying to reach out for objects that came out of the screen, and when asked what he thought of it after the show, he described it as being magic! 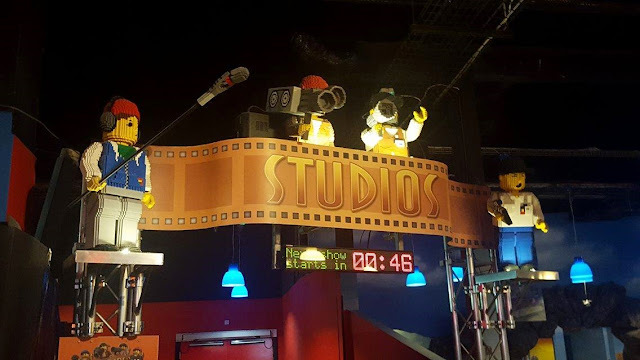 The 4D films run regularly throughout the day, so if you miss one showing, don't worry, just enjoy one of the many other activities and keep an eye on the countdown board which will tell you when the next show starts. After the show, Riley had become thirsty and so I purchased a Capri Sun juice drink from the cafe for him which cost £1.40. There was also a range of sandwiches, snacks, fruit and cakes available if you were feeling hungry, and there was a meal deal available for £5. Even though I was only purchasing a drink, the lady on the till was so friendly and took the time to ask my son whether he had enjoyed his day so far, and asked what is favourite part had been. It is so easy to take the time to be friendly and polite to customers, but it is something that many people forget to do, but not in the Legoland Discovery Centre! Every single member of staff we spoke to came across as really friendly and enthusiastic, and I think that this always helps to improve the experience for guests. At one point I asked a staff member for directions to the toilets, and rather than just tell me, she said "Come with me, I will show you the way". Again this may seem like a little thing, but I appreciate the fact that she took the time to help out. At present, some of the attractions are currently closed, but if you visit during this time then you will receive a ticket to return once the work has been completed which seems very reasonable as there is still plenty to do in my opinion. The area where work is taking place is all boarded off, and pictures have been placed up on the boards to try and divert you from the fact that work is taking place. 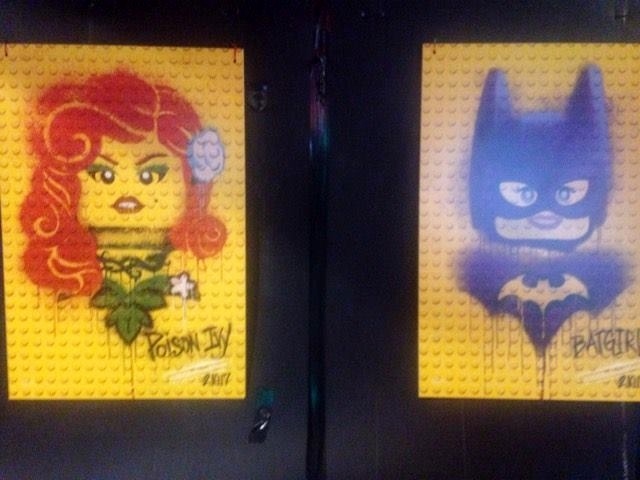 The pictures are really cool and based on the Lego Batman characters which look like they have been spray painted onto the wall. After nearly two and half hours here, we decided to make our way out, stopping by Miniland again on the way to take a look at some of the amazing creations once more. Whilst leaving we came across a fun spy activity where you had to try and pass through laser beams, Riley was a pro at this, as he was able to pretty much fit under the lowest one and so simply crawled under on his belly. This made him feel like he was capable of being Batman's sidekick and was really pleased to have managed the task! 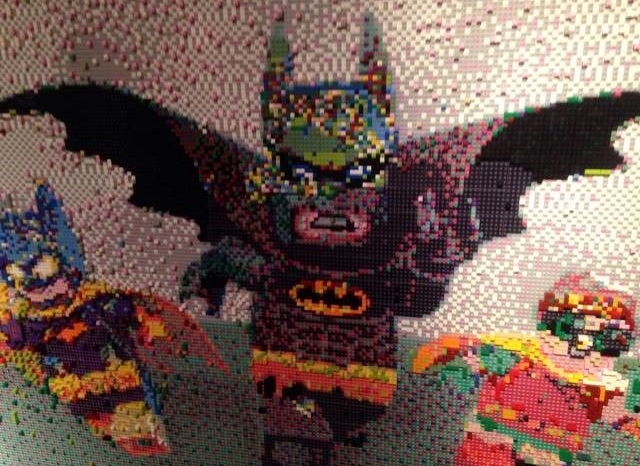 There was also a fantastic batman themed mural board where you could add lego to the design. This looked fabulous, and I wish I could get something like this for Riley's bedroom. Like most attractions nowadays, the exit is via the shop, which has a huge range of lego available to purchase. I always set my children a limit before we visit anywhere, so that they know exactly how much to spend and saves any awkward demands for money at the end of a trip. They each purchased a small memento, and Riley also bought a Lego Batman minifigure blind bag to add to his ever expanding collection. 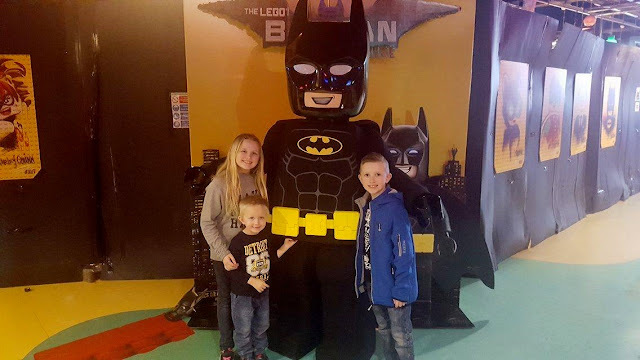 Overall we had an absolutely fantastic morning at the Legoland Discovery Centre in Manchester, and seeing Riley's face when he met Lego Batman was amazing, and has definitely created a lovely family memory for us. In total we were in the attraction for nearly 3 hours, however had we not been limited on time that day, we could have quite happily stayed another couple of hours. I feel that the staff are a credit to the attraction, and were more than happy to help customers and always with a smile. 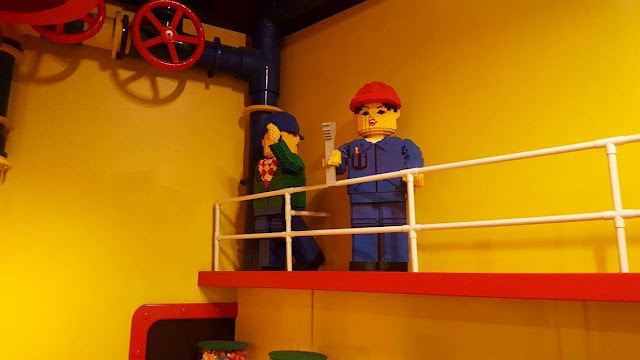 The facilities were all clean and tidy, and I regularly saw staff walking round checking all the lego building areas and tidying up any bricks that had fallen on the floor. 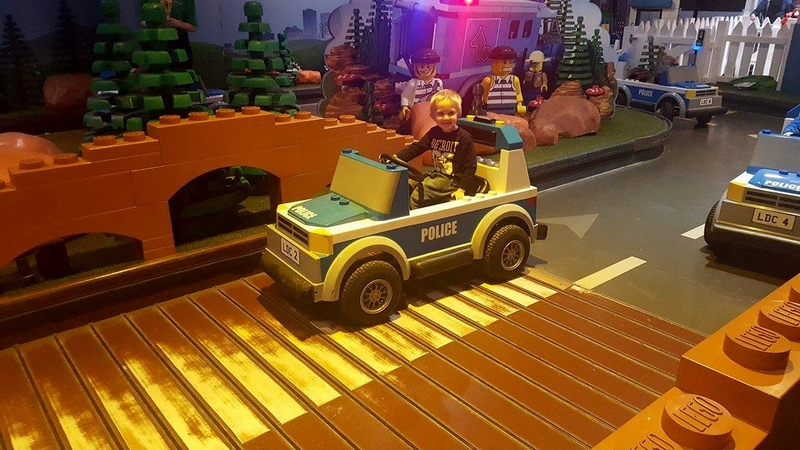 We visited the Legoland Discovery Centre, not quite sure what to expect, and came away with some fantastic family memories. We can't wait to return when the other attractions reopen, and I would definitely recommend to others. Tickets are available online here and cost £15 for an adult entry, and £11 for a child aged 3-17. Under 3's are admitted free of charge. Adults are not permitted to enter the attraction without being accompanied by a child under the age of 17, however the attraction does run Adult only evenings on certain dates to cater for their older Lego loving guests too. 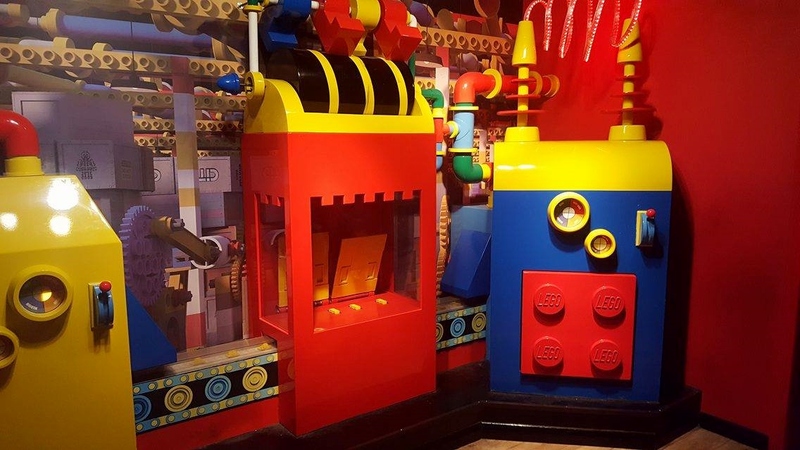 Tickets are also available on arrival at the attraction, however these cost slightly more than the online saver rate, and are subject to availability. For extra value, you can also buy combination tickets which combine your trip to the Legoland Discovery Centre with a trip to Sea Life Manchester, so you can enjoy both attractions on the same day. 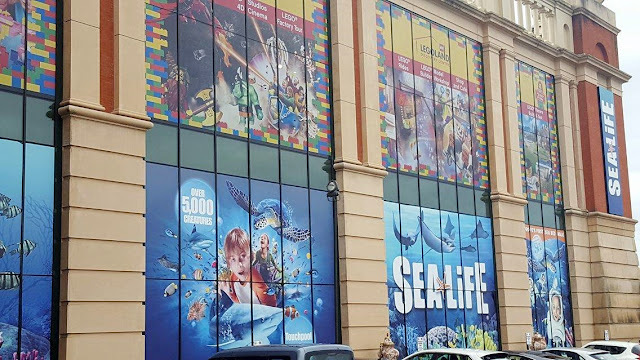 However should you run out of time the Sea Life entry is valid for 90 days from the date of purchase meaning you can come back at a more convenient time if need be. These tickets cost £25 for an adult and £16 for a child aged 3-17. Under 3's are admitted free of charge. 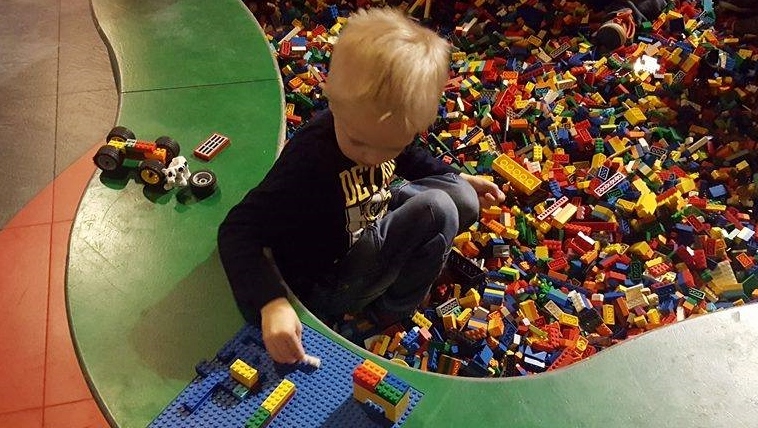 Disclaimer: We were provided with a complimentary family admission for the purpose of providing an honest review of our experience. We hope to return when the refurbishments have taken place and will update the blog post accordingly with the other available attractions at the point. All opinions and photos are my own. Any entry prices, opening times, or attractions stated are correct at time of writing.